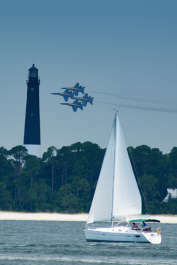 Sail and watch the Blue Angels fly overhead as they practice their world-class maneuvers! 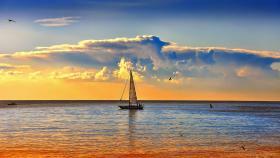 You can get as involved in the sailing process as you like, or if you choose, just sit back and let us handle everything. We provide water and ice, so please feel free to bring any snacks and/or drinks you like. Please arrive at 715 Pensacola Beach Blvd. Pensacola Beach, FL (blue building) at 8:45am in time for a 9:00am departure. If you have questions, please contact us at (850) 293-1434 or captlinda@gulfbreezesailing.com.